When visitors to Indiana Dunes State Park near Chesterton, Indiana, head off the entrance road and down toward the beach, they come upon a 400-car parking lot just a few hundred yards from Lake Michigan’s edge. To the north spreads Sunset Beach, a popular spot for sunbathers and swimmers. Other than the two-story pavilion that serves as a cafeteria and rest spot, the beach enjoys a wide-open view of the lake and shoreline. To the west is a massive foredune covered in marram grass, with hiking trails passing through trees, flowers, and cacti. To the east, visitors can trek to the end of the beach and on to Mt. Tom or the park’s rare oak savanna. Recently, this particular spot has been at the center of a clash between environmental groups and the Indiana Department of Natural Resources (DNR) over a proposal to build a 100-room hotel and conference center where the large lot now sits (to see a map of the proposed location, click here). Tom Anderson, executive director of the Save the Dunes Council, said the group first heard of the plan in a meeting with DNR director Kyle Hupfer late in 2005. After discussing DNR proposals for a wetland restoration project in the park and the removal of part of a parking lot that covered Dunes Creek — both completed since — Hupfer announced DNR’s intention to request proposals from hotel developers. “How he presented it was that there were these other important, very innovative projects, but these projects would also reduce the number of additional parking places, so they would be reducing revenue,” Anderson says. State officials, struggling with statewide budget shortfalls, saw the proposed hotel as a way to bring in needed tourism dollars. The state park welcomes thousands of visitors each year — about 670,000 in 2005 — but according to an April audit, the majority of those visitors use the park as a day trip. “Obviously, we’re not getting the kind of economic impact from the visitors we have if they’re just staying a few hours and driving back,” says Speros Batistatos, president and CEO of the Lake County Convention and Visitors Bureau, which supports the hotel. Six inns already exist inside state parks in Indiana, all owned by the state. But this time, the DNR asked private developers to submit proposals for the Dunes, as well as for state parks in Potato Creek and Versailles. That way, the state wouldn’t need to front its own money but would instead lease up to six acres of land to a developer for up to 100 years. The parking lot sits on the “footprint” of a former inn, which was built in the 1930s by John Lloyd Wright, son of the famous Frank. The original hotel was a dormitory-style concrete building with two floors of small rooms, and was knocked down decades ago. Though other buildings aren’t far away — other structures in the park include small park offices and picnic shelters, and the small town of Dune Acres sits just outside the park’s borders — the pavilion is the only building in the immediate beachfront area. Established in 1923, an early victory in a decades-long battle to protect the Dunes, Indiana Dunes State Park harbors one of the most unique ecosystems in the Midwest. More than 400 species of plants grow in the park, ranging from the common prickly-pear cactus to the federally endangered Pitcher’s thistle. Thirty-seven species of mammal and more than 250 bird species have been documented here. Most remarkable are the astounding variety of landforms, hydrology and soil types that, combined with adjacent Indiana Dunes National Lakeshore, make this a rare and special place. 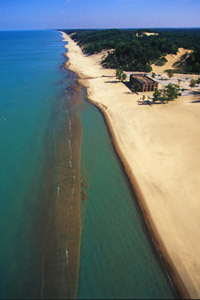 Like a no-man’s-land along the border between two warring countries, Indiana Dunes State Park lies on the often turbulent zone where the gentle Midwestern land meets one of the largest lakes on the planet. The park’s landforms and plant communities are constantly reshaped by gusty winds and water off Lake Michigan’s straightaway. It was this quality of unsettledness at the Indiana Dunes that led University of Chicago professor Henry Cowles to develop his pioneering theories about plant succession, studying the way vegetation anchors sand to form dunes, leading to larger and more stable plant communities — sand prairies, woodlands, and marshes — as one travels inland. But blowing sand was only one of the concerns brought up in the months following the proposal. Both citizens and advocates wanted to know what a hotel would do to the experience of nature in the park. Other concerns included wastewater treatment, the possibility of a hotel restaurant serving alcohol, and the long-range effects of changing lake levels and erosion on the building. To the delight of many dunes advocates, the DNR’s request for proposals failed to elicit any bids from developers by a May 31, 2006 deadline. “[D]evelopers who had been at the meetings said they thought it was almost impossible to do what DNR wanted with a 100-room hotel — saying it had to be a 200-room to be financially viable,” Tom Anderson said. But Hupfer has said the state might consider building a hotel itself. The state could also bring the plan to a specific developer, fund it through a bonding process, table the idea for a later date, or give up the plan altogether. As of press time, the DNR had not announced its intentions.